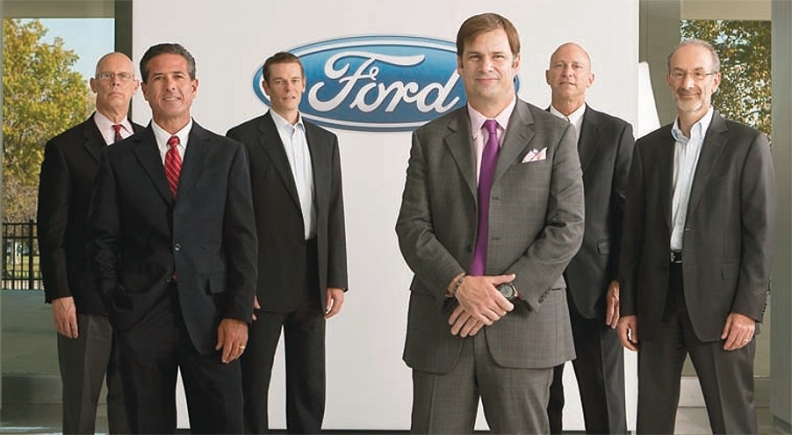 The Ford marketing team: Jim Farley, center, worried he wouldn't fit into Ford culture. Instead he changed the culture. Reports directly to Ford CEO Alan Mulally. His appointment marks the first time Ford has a single global leader for marketing, sales and service. Oversees all sales and marketing operations in North America. Responsible for all marketing functions of the Ford brand. Works with Murat Yalman, looks at technology and what should be in Ford's cars. Responsible for all advertising and consumer communications initiatives, including digital, experimental and direct marketing. Heavily involved with product planning. NEW YORK -- It was arguably the darkest hour for American automakers: Struggling with the collapse of the global economy, the U.S. government in 2008 bailed out General Motors and Chrysler with generous loans that incited rancor and debate across the country. Not so with Ford. It seemed rather a risk for the iconic marketer to turn down the Troubled Asset Relief Program; it wasn't as though the brand that Henry built wasn't in trouble like its Detroit counterparts -- the company lost $14.6 billion in 2008. But turning down the funds turned out to be a sage move. When asked just how much declining TARP funds was worth, Ford marketing chief Jim Farley doesn't hesitate: "I think it was worth more than $1 billion of coverage and customer interest," he said. "If I had to go out and advertise, it would be that kind of bill in paid media. It's a once-in-a-lifetime thing." Most top marketing officers would kill for $1 billion in free goodwill. But for Farley, that was just the beginning of a long road that helped the grand dame of automakers survive the Great Recession -- with a little bit of luck, a little bit of timing and a little bit of chutzpah. Ford is now firmly entrenched back in the No. 2 spot for U.S. sales among automakers, with 17 percent of the U.S. auto and light-truck market in the first nine months of 2010, behind GM. The company's products are better than ever, promoted and marketed by a revamped strategy headed by Farley. U.S. yearly sales are up 19 percent through September, almost double the industry-wide gain of 10 percent. Ford's $4.7 billion profit in the first six months of this year is the company's largest since 1998. Advertising Age began its annual marketer award in 1971. Automakers have won seven times. 1. Went through bankruptcy reorganization in 2009 and emerged from Chapter 11 as General Motors Co.
2. Went through bankruptcy reorganization in 2009 and emerged from Chapter 11 as Chrysler Group, controlled by Italy's Fiat. 3. Bought Jeep in 1970. Detroit's ailing No. 4 automaker in 1979 agreed to sell stake to Renault; French firm ended up with 49% stake by early '80s. Chrysler bought AMC in 1987. Meanwhile, Ford's ability to secure the commercial loans that helped it avoid a government bailout has led to huge perception gains. An Oct. 1 Rasmussen Reports survey, for example, found 55 percent of survey respondents said they are more likely to buy a Ford because the company did not take TARP funds, a stunning figure almost two years after the fact. "This is a scrappy team, a surviving team," Farley, 48, said of the marketing group that he took over in 2007. "When they got some crazy new leader, they stayed with him." Back in 2007, when CEO Alan Mulally was trying to recruit Farley from Toyota, where he had led marketing for the luxury brand Lexus, they met in Dearborn, Mich. Farley was impressed with the plan the new CEO had in mind. "He pulled out a document and there were, like, 200 individual models on it. But he said to me, 'You see this blue oval? We are going to focus on Ford, and take Ford and integrate it globally,'" Farley said of his meeting with Mulally. "As a competitor, I was always scared that Ford was going to do that." But the bigger concern was a cultural one. Farley, a self-described "freak," was worried he wouldn't fit in at Ford. "By 'freak,' I mean that I like bottom-up ideas, creative thinking at the client, not the agency. I expect our team to come up with new ideas and I expect that to flow up from the bottom. I was worried the culture would reject me like a bad organ," Farley said. "Alan just said, 'Jim, we'll stand back to back. Like Wyatt Earp.'" Instead of wondering whether he would fit in with the culture of Ford, Farley changed the culture. "Some people here thought we should talk about technology or history -- 'We need to talk about Henry Ford!' -- instead of telling the consumer how good the product is," he said. So Ford reprised its "Swap Your Ride" campaign, where it has Honda and Toyota owners test drive Fords, and used the testimonials in its advertising. It launched the 2011 Explorer crossover on Facebook and created a campaign called the Fiesta Movement, which loaned out the small car to young social-media-savvy bloggers across the country to let them seed and spread the word long before the car was set to launch in the United States. "Jim Farley has done a superb job," said longtime automotive advertising and marketing executive Peter DeLorenzo, who now runs AutoExtremist.com. "When he came to Ford, he came at the perfect time. The company was already focused on a new course thanks to Alan. “Farley took all the constituents of marketing and got them on the same page. He took some risks with the advertising, and Ford's products are getting better by the month. It worked out. The marketing and advertising has all come together nicely." Among the bigger risks? A truck campaign for the F-150, which went against everything one is used to seeing in an ad for a pickup truck, DeLorenzo said. "It's witty, it's well written, and it makes tremendous use of Denis Leary's voice-over. It's almost cerebral in a way." Ford actually cut U.S. ad spending in 2009 as it consolidated its focus on the Ford and Lincoln brands, though it raised network TV, print and internet spending, according to the Advertising Age DataCenter. U.S. measured media spending for the first half of 2010 was $530.2 million, up 10.9 percent from $478.2 million spent in the same period of 2009, according to Kantar Media. It also merged advertising and public relations; gone is the church-and-state separation. "We're now praying together," said Farley. Its commercials, featuring everyman Mike Rowe, the host of Discovery Channel's "Dirty Jobs," are a hit, and it tapped social media to launch the Fiesta in China -- a move that inspired the U.S.'s Fiesta Movement. "Other than Facebook, China has the largest social-media sites in the world," Farley said. "So we imported 100 Fiestas and started a campaign that asked people to take a picture of themselves with the Fiesta if they saw it on a street, and spread it around." Some of those same practices will be adopted globally and domestically when Ford launches the next-generation Focus. Meanwhile, Ford's ad agency, Team Detroit, a consortium of five WPP shops, has its roots in JWT's first efforts for Ford a century ago. And at a time when the single-holding-company model is often knocked in the ad industry, Farley and Team Detroit Chief Creative Director Toby Barlow enhanced a model Farley developed at Toyota called Train, in which the agency taps the best talent it can find -- even if it means dipping outside of WPP. "Toby is the coach of a fantasy league and he gets to pick the dream team every time we have a project," Farley said. "It allows us to have a freshness in the agency-client relationship over and over again." Farley said it could be as diverse as bringing in a creative who worked on a Harley-Davidson motorcycle campaign to work on a Ford F-150 truck assignment, or hiring an artist who does country-western CD art to work on a brochure. "It hasn't been perfect," said George Peterson, president of the automotive research firm AutoPacific, citing Lincoln. "The Lincoln launches, even though they threw a lot of money around, it still doesn't seem to have resonated yet with people around the country. There are examples of launch-and-leaves out there where Ford just cannot keep enough weight on a product." For instance, the Ford Flex was launched in the first week of the recession and isn't nearly up to the level of the other models. Still, Peterson, a Ford owner and former employee himself, said he likes what he sees. "One, they have focused their marketing message," he said. "Two, they are not only marketing to prospective customers, but to their present customers as well. I receive plenty of direct mail and e-mails from Ford. Three, their outreach has never been better. They're probably doing more television than anybody expected, especially with the Mustang and the Fiesta." Ford also is an industry leader in onboard technology with its SYNC in-car communications and entertainment system, co-developed with Microsoft. Farley called mobile marketing the most underrated technology right now. "People are spending hours on their devices with all this cool data and content, and we're not part of the conversation," he said. "There hasn't been this kind of moment in modern marketing since TV in the 1950s. We haven't seen such a quick flip of media consumption like that, and we as marketers haven't caught up. The smart companies, like General Mills, are going to application people and making it work." Farley said he envisions a day where something like SYNC "becomes a revenue platform. Not only for us, but for companies that develop applications. Five to 10 years, tops. Who would have believed we'd be talking about us, a car company, being a leader in that technology?" Farley pauses for a moment. "Can you imagine?" he says. "My grandfather was an employee of this company. [He owned a Ford dealership.] I love the brand, I love the products. This is for the marketing and PR team at Ford who all responded to a crisis in a way that no one could predict. The fact that we're sitting here talking about (this) is the coolest thing I could ever think of."